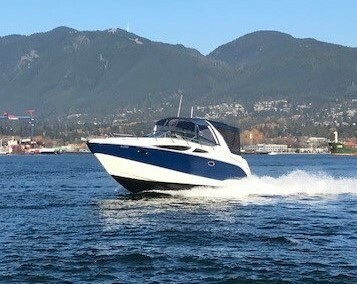 2011 Bayliner 335 Sunbridge for sale in Burnaby, BC. M & P Mercury Sales Ltd.
Low hour, low usage Bayliner 335! 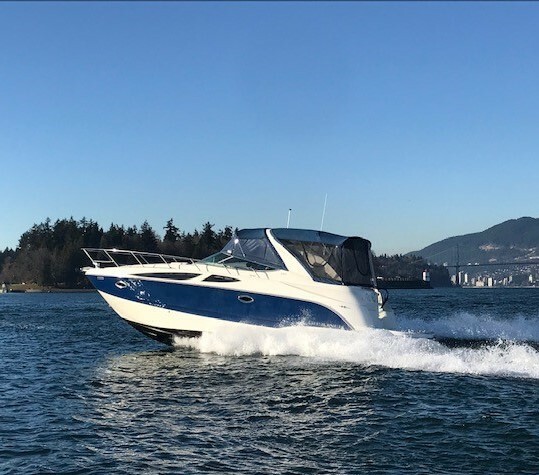 The 335 Cruiser is the flagship of the Bayliner fleet. 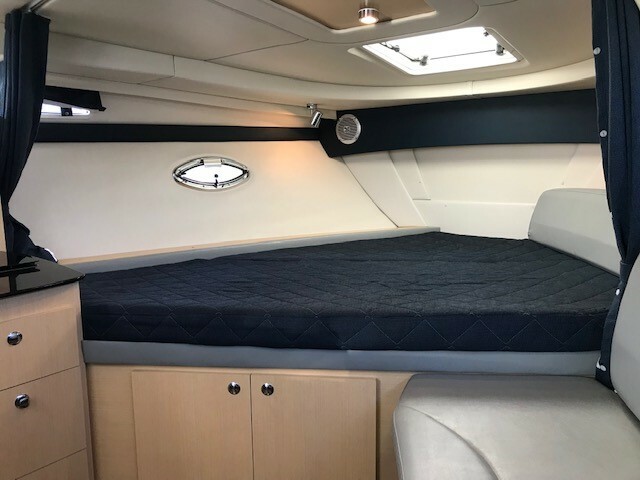 This is a very large 33' boat with an expansive and open cabin along with a spacious cockpit. This is certainly a boat that needs to be on your short list of cruiser options. Powered with twin Mercruiser 5.0L MPI Mag Bravo III (260 PHP) FWC. The cabin below boasts an abundance of storage while accommodating up to six guests overnight. 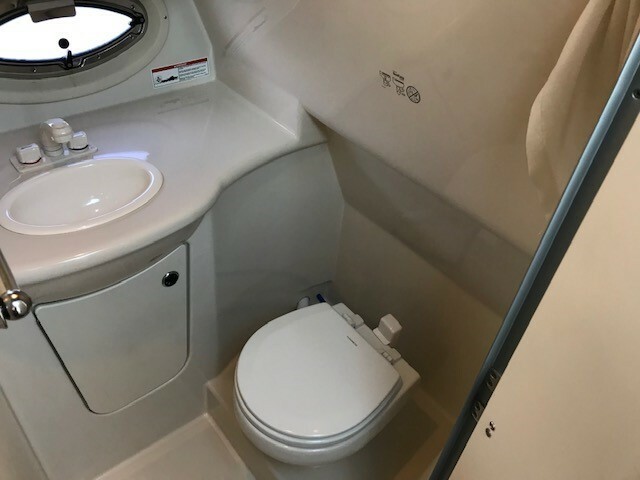 What makes the 335 unique is a separate private mid berth with its own entry door which is large enough to walk through standing up! A true 33' cruiser that two couples can enjoy without having to sleep in the same quarters!!! Its a great family feature that truly makes the 335 stand out in its class of cruisers. Top deck, you will find an expansive cockpit entertainment area with ample seating for many guests to enjoy. All one level, the cockpit is well though out with a wet bar and cockpit refrigerator. The engine room has plenty of accessibility and is powered by an electric lifting hatch. Stunningly styled and well designed, the 335 turns heads at the docks—and its pair of 5.0L MPI MerCruiser engines power you to favorite ports of call. Dock with ease thanks to optional Axius joystick control. On breaks between cruises, retire to the massive, light-filled cabin. With two interior layouts to choose from and an array of features and options, the 335 satisfies any avid cruiser's tastes. Lounge Cockpit Seating: The standard divided lounge cockpit seating invites you to kick up your feet and relax. Roomy Head: Electric flush, shower, sink and a port light all come standard in the 335's roomy head. 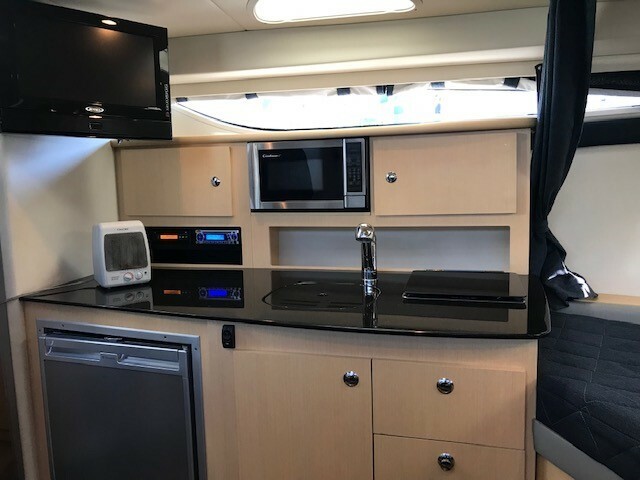 Full Galley: Dual-burner electric stove, fridge, microwave and stainless steel faucet bring out the chef in all of us. Sleeps Six: With the fixed forward berth, feel free to invite extra guests on extended trips - the layout sleeps up to six. Air Conditioning/Heating (110V/60Hz - 16,000 Btu): Reverse-cycle air-conditioner unit engineered to provide the necessary amount of BTUs to keep cabin cool. Reverse-cycle design allows unit to provide either cool or warm air into the cabin on demand. Bottom Paint: Specially engineered paint to prevent marine growth on the submerged portion of the hull. Greatly reduces the amount of required upkeep to keep the hull running surface clean while optimizing hull efficiency by reducing drag caused by marine growth. Bow Thruster: Reversible impeller attached to an electric motor integrated into the hull near the bow. Provides directional control of the bow at low speeds. Particularly helpful when docking or maneuvering in tight quarters and prevailing side winds. Cockpit Cover: Custom-fitted removable cover which extends from the windshield aft to the transom. Protects cockpit area from the elements. Greatly reduces the amount of upkeep necessary to keep the cockpit area nice and dry. Entry Door Screen: Sliding screen door integrated into the cabin entryway. Allows for cabin ventilation while providing protection against insects entering into the cabin. Generator, Gas (110V/60 Hz - 5.0 Kw): Onboard electric start generator which provides AC power to appliances and outlets. Provides comfort and convenience of having AC power supply to all appliances when shorepower is not available. Greatly reduces the voltage drain on DC batteries. Generator, Diesel W/Sound Shield (110V/60 Hz - 4.0 Kw): Onboard electric start generator which provides AC power to appliances and outlets. Provides comfort and convenience of having AC power supply to all appliances when shorepower is not available. Greatly reduces the voltage drain on DC batteries. Sound shield greatly reduces noise transmission while generator is operating. Head System (Vacuflush®): Electrically operated head system which extracts waste through a vacuum line into the holding tank. Efficient method of flushing head system using minimal amount of water. Macerator: Specially designed macerator pump designed for pumping waste from holding tank. Allows for overboard discharge of holding tank (when in legal waterways). Eliminates need for dockside pumpout of holding tank (where approved). Stainless Steel Center Walkthrough Bow Rail: A unique bow rail design with a center opening at the foredeck. Allows easy access from the bow to a dock or ramp from the foredeck. 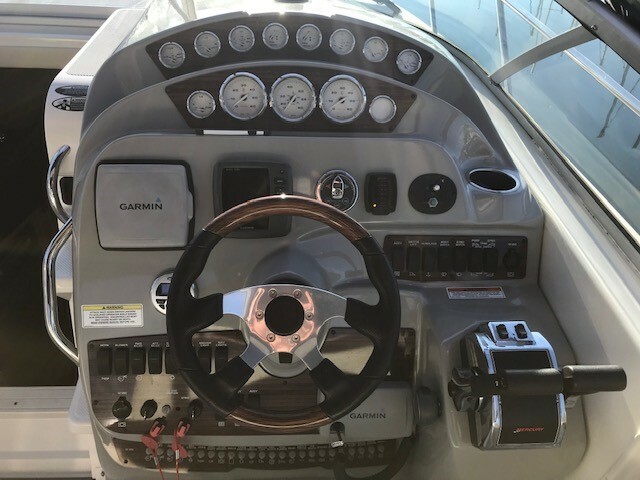 Trim Indicators: LED indicators located on a dash module which indicate position of trim tabs. Provides operator with knowledge of trim tab position to better understand and predict boat performance caused by trim tab. Camper Back Cover: Full canvas enclosure for cockpit area featuring stand-up headroom throughout with removable side curtains. Makes the cockpit area comfortable and usable during inclement weather. Also serves as great protection against the elements when the boat is not in use. 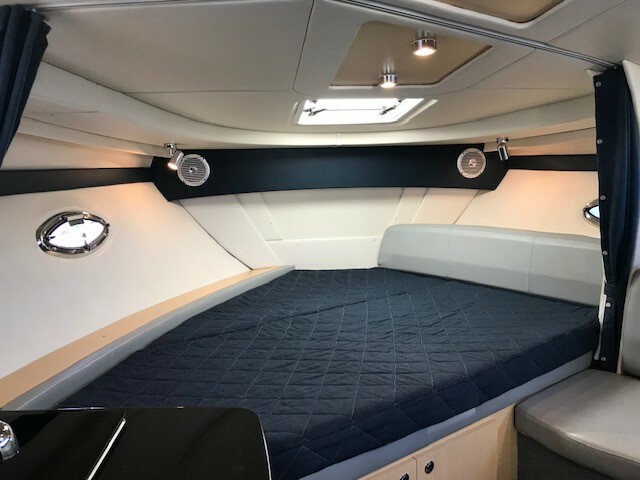 Foredeck Cushions/Rails: Custom-filled cushions for sun lounging designed to fit foredeck area. This option also includes handrails on either side of the cushions. Makes the bow area a great place to get some sun. TV/DVD: Swivel-mounted TV including built-in DVD player. Provides great entertainment for family and friends, and lets you choose what you want to wat. Power Engine Hatch Lift: An electric actuator which opens the engine access hatch from the helm. Very popular feature which makes access to the engine compartment almost effortless. Transom Remote for Sound System: Water proof remote control for stereo system. Allows for convenient control of the stereo. 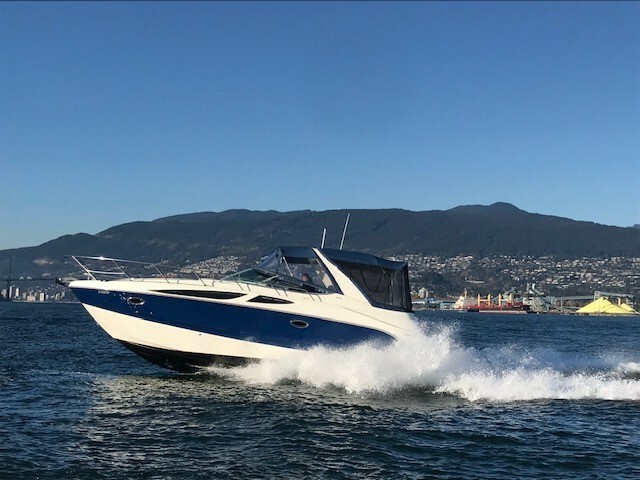 Twin 5.0L Mpi Mercruiser Bravo Iii (260 Hp): The 5.0 MPI is one of Mercury's most popular engine choices providing excellent power for cruisers at an affordable price. Its proven V-8 base engine delivers year-after-year performance and reliability. Twin 350 Mag Mpi Mercruiser Bravo Iii (300 Hp): The 350 MAG is the perfect choice for the power-hungry boater. Impressive torque combines with smooth delivery for spirited acceleration and quiet operation. The 350 MAG is ideal for powering larger cruisers. This upgrade will provide shorter time to plane and higher top-end and cruising speeds. Twin 350 Mag Mpi Mercruiser Bravo Iii With Emissions Control (300 Hp): Upgrade for environmentally conscious boater. Provides the same performance as the upgrade to the 350 MAG with enough power for active boaters. Required engine in California. Twin 5.0L Mpi Mercruiser Bravo Iii With Axius Premier (260 Hp): The addition of the innovative Axius option provides an incredible ability to manipulate the thrust and direction of the twin sterndrive engines individually to provide low speed maneuverability. Especially useful for docking and maneuvering in tight quarters. Easy to understand and use, even for the novice boater. Twin 5.0L Mpi Mercruiser Bravo Iii With Axius Premier And Seacore (260 Hp): This engine combination adds a closed cooling system which allows freshwater to be circulated throughout the engine for cooling purposes. This greatly reduces any corrosion which occurs as a result of running saltwater through the engine components. Recommended for saltwater boaters. Expect the same performance as the Axius Premier. T-350 Mag Mpi Mercruiser Bravo Iii With Axius Premier And Seacore (T-300Hp): Axius engines allow the highest level of maneuverability of any engine on the market. Dock horizontilly or even diagonally with the soft touch of the joystick. Easy steering for even a novice. The addition of SeaCore provices a closed cooling system which allows freshwater to be circulated throughout the engine for cooling purposes. Twin 5.0L Mpi Mercruiser Bravo Iii With Freshwater Cooling (260 Hp): These engines have a closed cooling system which allows freshwater to be circulated throughout the engine for cooling purposes. This greatly reduces any corrosion which occurs as a result of running saltwater through the engine components. Expect the same performance as the upgraded 5.0L MPI engines. Twin 350 Mag Mpi Mercruiser Bravo Iii With Seacore (300 Hp): These engines have a closed cooling system which allows freshwater to be circulated throughout the engine for cooling purposes. This greatly reduces any corrosion which occurs as a result of running saltwater through the engine components. Recommended for saltwater boaters. Twin 350 Mag Mpi Mercruiser Bravo Iii With Emissions Control And Seacore (300 Hp): Upgrade for environmentally conscious boater. Provides the same performance as the upgrade to the 350 MAG with enough power for active boaters as well as a closed cooling system which allows freshwater to be circulated throughout the engine for cooling purposes. Recommended for saltwater boaters. Available in California. Beam Forward Design: Unsurpassed interior space in the industry. Smooth Ride System™ (SRS): Matches the hull design to its specific application to achieve superior acceleration with fuel-saving lower horsepower engines, a softer ride and a safer handling boat that planes quickly. Computer Aided Design (CAD): Files are sent to a computerized five-axis router that produces molds that are accurate to within 1/25,000th of an inch, which means products are built to consistently high quality standards. Pre-Cured Finish Guard: ArmorFlex® 954 gelcoat backed by a layer of fiberglass and Hydropel® vinylester resin. Diamond-pattern Textured Walking Surface: Molded into the boat during construction on designated walking surfaces. KidClean™: Treated Upholstery: Resists fading, weathering, wear and staining. Vinyls: Heavy-duty marine-grade, UV-protected and solution-dyed. Best in Class Warranty: Lifetime limited transferable hull warranty on all Bowriders, Cuddies, Crossovers and Deck Boats accompanied by a five-year limited deck warranty. Engine Warranty: Mercury MerCruiser and Outboard engines come equipped with a two-year limited engine warranty.